The 85-hp turbocharged TwinAir engine (shown) debuts this summer in the Fiat 500 minicar. TURIN – Fiat S.p.A. is taking engine downsizing to a new level with the introduction of its new 900cc, two-cylinder TwinAir unit. When it goes on sale in the Fiat 500 minicar this summer, the 85-hp turbocharged engine will be the only two-cylinder engine available in a car in Europe. Fiat will debut the engine at the Geneva auto show on March 2. Globally, Tata Motors is the only other carmaker currently offering a two-cylinder engine. The Nano minicar, which debuted in India last summer, has a 33-hp 623cc engine. Automakers are removing cylinders and lowering the displacement of their engines to meet tougher CO2 emissions rules that take effect in Europe in 2012. Fiat has not released the TwinAir's official CO2 performance information, only saying that the 500 minicars sold with the engine will produce less than 100 grams per kilometer of the greenhouse gas. The greenest version of the 500, the PUR-02 equipped with a standard stop-start system, currently emits 113g/km. The TwinAir engine is a key part of Fiat brand's aim to remain Europe's leader when it comes to fleet CO2 emissions in Europe. Fiat brand had average CO2 emissions of 129g/km in the first half of 2009, according to UK-based market researcher JATO Consult. That places it ahead of Toyota, which had fleet emissions of 132.9g/km during the same period. Internally called SGE, for Small Gasoline Engine, the TwinAir has Fiat's fuel-saving MultiAir technology. MultiAir improves power and cuts fuel consumption by 10 percent with electrohydraulic variable valve timing. Fiat chose the TwinAir name to because this is the first application of MultiAir technology on a two-cylinder engine. 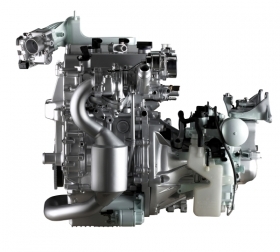 In terms of capacity, Fiat's TwinAir is the smallest gasoline engine available in Europe. Mercedes Benz unit Smart's ForTwo minicar offers Europe's lowest-displacement engine, a 45-hp 799cc three-cylinder diesel. Rivals such has Volkswagen AG started developing a two-cylinder unit for its new Up family of minicars, but decided to continue using the group's gasoline and diesel three-cylinder engines. Chevrolet, Citroen, Daihatsu, Mitsubishi, Opel/Vauxhall, Peugeot, Subaru, Suzuki and Toyota also offer three-cylinder engines in Europe. Fiat has a long tradition of two-cylinder engines. Its first debuted as a 13-hp 569cc unit in the 1936 Topolino. A 13-hp 479cc unit was used in the 500 that arrived in 1957. The last two-cylinder engine built by Fiat was the 31-hp 704cc unit offered on the Cinquecento minicar from 1991 to 1996. In addition to the 85-hp TwinAir that debuts in Geneva, there will be a turbocharged 105-hp version and a 65-hp normally aspirated variant of the engine. Fiat will add the TwinAir engine to other minicars and subcompacts, beginning with the successors to the Fiat Panda and Lancia Ypsilon minicars. Both replacements are due in the second half of 2011. The TwinAir, which is designed to run on gasoline or compressed natural gas, will be built at Fiat Powertrain Technologies' plant of Bielsko Biala, Poland. Fiat has not yet announced production volumes for the engine.